WHO says arts in Singapore doesn’t pay? The arts scene is brightly evolving to change the mindsets of the younger generation that they can make a sustainable living out of it. The four-letter word ‘arts’ is making heads turn as the seventh edition of Singapore Art Week (SAW), the biggest visual arts celebration here – which runs from Jan 19 to 27 – features art installations and exhibitions across Singapore. The public will also be able to attend a series of art workshops, talks and film screenings throughout the week. SAW is a joint initiative by the National Arts Council, Singapore Tourism Board and Singapore Economic Development Board. Industry experts and veterans say while it remains very difficult for young Singaporeans to pursue artistic careers full-time, the arts scene has improved over the last decade, with more opportunities for artists to sustain themselves financially. Best news come with government efforts to increase public participation in the arts, the advent of technology and a more supportive public attitude have also contributed towards a better working environment for Singaporean artists. 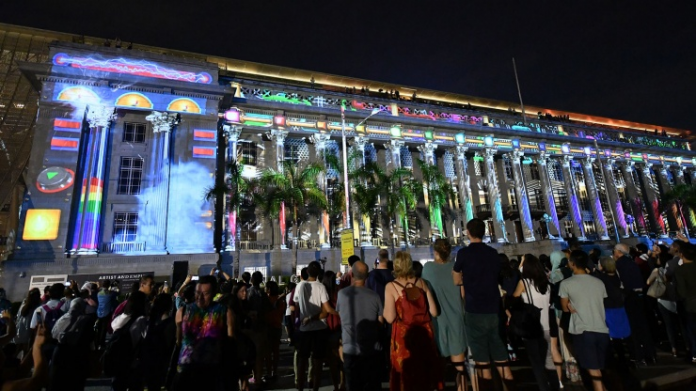 In October last year, Ms Grace Fu, Minister for Culture, Community, and Youth, announced the launch of Our SG Arts Plan, which laid out the focus areas for Singapore’s literary, performing and visual arts sectors from 2018 to 2022. She said the plan would allow the Government to provide better support for arts professionals and make the arts more accessible to all. The Our SG Arts Plan builds on the Arts and Culture Strategic Review released in 2012, which detailed the arts and cultural landscape for Singapore until 2025. The plan aimed to develop “a nation of cultured and gracious people, at home with our heritage, proud of our Singaporean identity”. Since the launch of the review, the National Arts Council (NAC) recorded a high of nearly 6,000 non-ticketed performing arts activities in 2016, a five-year record attendance of over 9.2 million at these activities, and more than 5.1 million visitors to museums and heritage institutions. The NAC said that S$300 million was pumped into the culture sector between 2012 and 2017. Apart from these two road maps for the arts scene, the Government has also introduced several initiatives the last decade to raise the profile of the arts in Singapore, such as launching the School of the Arts (SOTA) in 2008. As the first pre-tertiary arts school in Singapore, SOTA’s programme allows students to take one arts subject, in addition to the usual academic subjects taught in mainstream schools. The steady increase in SOTA’s enrolment over the last few years shows that while the jury is still out on the success of its programmes, there is still a demand for an arts-oriented education programme in Singapore. Several SOTA graduates said that the school’s curriculum had broadened their minds. For performer and music composer Amni Musfirah, 24, “SOTA had helped to develop a good sense of who I want to be, what I want to do and what do I want to achieve”. “Many people outside of SOTA thought we couldn’t succeed because we were just doing ‘arts’ and had ‘no brains’. SOTA taught me the importance to believe in ourselves and trust that our skills will pay off,” says Ms Musfirah, who was part of the school’s pioneer batch of graduates in 2012. Many artists acknowledged that the Singapore Government is a lot more generous than those in many other countries in the level of funding that it has set aside for the arts sector, and they are grateful for it. Video artist Kray Chen, 31, the recipient of the NAC’s Young Artist Award in 2017, said he was a beneficiary of the council’s funding. There are only a handful of countries in the world that fund artists at an international level. We are very lucky to have a well-funded system. While we could lose out on freedom of expression, Singaporean artists have definitely gained on a practical level. The NAC requires artists who receive funding between S$25,000 and S$100,000 to provide a certified statement of accounts by a registered accountant. Grants above S$100,000 must be independently audited by a registered public accountant. Mr Kamil Haque, founder and artistic director of Haque Centre of Acting & Creativity, said that while arts grants in Singapore are much higher and more accessible to artists compared to the United States, the red tape that artists have to surmount to receive those grants make it “onerous” for them to even start off. This may make it difficult for young artists to sustain their interest and pursue the arts full-time, said the 36-year-old, who had spent eight years in Los Angeles learning and teaching acting before returning to Singapore. The NAC said that grant criteria are developed by the council to ensure that projects supported the aims of the grant. Mr Kok Heng Leun, artistic director of Chinese-language theatre company Drama Box and former Nominated Member of Parliament, called for an overhaul in approach towards how the Government views arts funding. Referring to funding caps by NAC, Mr Kok said that grants are issued to artists with a “return of investment” thinking process, where they are expected to fund a certain percentage of their work in proportion to the grants that the NAC extends to them. NAC grants are subject to funding caps. For instance, artists who apply for NAC’s Participation and Presentation grant receive funds of only up to 50 per cent of the project’s budget. Despite the financial obstacles, several industry experts pointed out that the shift in societal attitudes has created a more favourable environment for younger artists to pursue their careers. Lasalle’s provost, Dr Venka Purushothaman, said that with Singaporeans becoming better-educated and more well-travelled, they have an increasing desire to embrace the arts. Over the last 15 years at Lasalle, he has seen more young people committed to engaging in the arts. He is also heartened by the support shown by parents. Dr Purushothaman’s observations reflect the rise of “new-generation parents” who are willing to let their children follow their passions, so long as they are happy. Yes, end of the day, believe in the truism that arts can pay here. And the greater awareness here means that younger artists are able to receive more support from their families. More importantly, this will allow the younger generation to pursue their passion with fewer concerns and be confident to pursue a full-time career in the arts, and look beyond the home shores.